New OS means fresh install, which is exactly what I did. I installed the latest Windows OS, along with Visual Studio 2015 and SQL Server 2014. 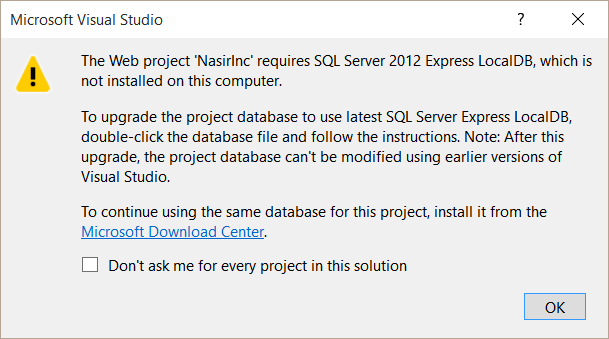 Then I tried opening one of my existing projects running on LocalDB, only to be greeted with this error. As a front-end developer, I’ve had my fair share of working with CSS preprocessors. Two of the most prominent preprocessors I’ve had the pleasure of working with are Sass and Less. They’re both great, and I still use both of them, but here’s why I’m leaving Less for Sass. Loggly is a great cloud-based logging tool. It enables developers to centralise their logging to one convenient location, which helps reduce the time it usually takes to log into the server where the project is located, find the relevant log files, and scroll through the countless number of lines to find that one specific log entry. Needless to say, it’s a useful tool indeed, and this plugin enables you to effortlessly implement this feature into your EPiServer CMS project. I started experimenting, and tried to implement an ASP.NET MVC approach to building my project.